Simply login to your account and redownload the fonts. By default, you are allotted 4 downloads. If you have exceeded this limit, please contact us with your order number so that we may reset it for you. Please note that you may only install the fonts on up to 2 computers belonging to you. If you have installed the fonts on more than 2 computers, we cannot reset your downloads. Charles Borges de Oliveira, the creator of LHF Desire, packed in over 700 glyphs into one font. The method you use to access these glyphs will vary depending on the application you are using. 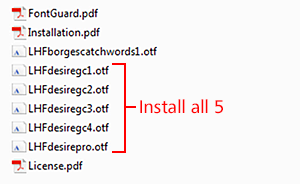 Notice that in the zip package you received 5 fonts. 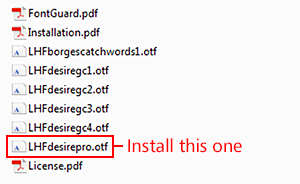 In most cases, you will only need to install "LHF Desire Pro" and not the other 4 "GC" versions. Please read each of the options below before installing and using these unique fonts. Please contact us if you have any questions or require additional assistance. The LHF Desire Pro font contains all of the 763 glyphs in one font file. Using the glyphs is as easy as selecting them from within your application's glyph palette. If you are not using an application that features a glyph palette or you do not have a third party application to help you access the hidden alternates, please refer to Option 2 or 3 below. *Learn how to use the "Insert Special Characters" function within Corel DRAW to access the hidden alternates for LHF Desire. The "GC" versions contain all the alternate characters distributed between 4 font files with the default glyphs in the "Pro" version. Do not attempt to use these "GC" fonts without the aid of our Glyph Copier, since they won't function like normal fonts. Once all 5 LHF Desire fonts have been installed, access the Glyph Copier for the LHF Desire GC fonts on the LHF Desire page. Learn how to access LHF Desire's alternates using the Glyph Copier in this video. *Gerber Omega, Flexisign, and SignLab will not display some glyphs due to their 217 glyph limitation. Option 3 below is recommended when using these applications. Difficulties downloading fonts using Firefox? Occasionally Firefox's profile settings can become corrupt due to incompatible add-ons. This can cause erratic download issues. The solution is to "Refresh Firefox" by resetting your add-ons & settings, following the instructions found here. How do I access the alternate characters? Many Letterhead Fonts contain alternate characters on seldom-used punctuation characters. In these cases, character maps are placed on each font page to show where the alternate characters can be found. A few fonts, however, have too many alternates to use the seldom-used punctuation characters we normally use. Therefore, we recommend using an OpenType compatible application such as Adobe Illustrator to access them. Tips for accessing alternate glyphs in Adobe Illustrator. On the Character Palette window (Window > Type > Character) in Adobe Illustrator there is an "OpenType" tab. This OpenType tab features buttons at the bottom. Pressing these buttons and then typing will give you different results. These are automatic substitutions made on-the-fly. Another way to access the alternates is to use the Glyphs window in Adobe Illustrator (Type > Glyphs). You can then select a letter in your text on the screen and then double-click on a character in the Glyphs window to change it. Tips for accessing alternate glyphs on a Mac. 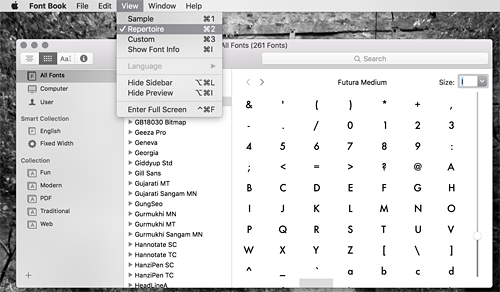 If you're using a Mac, access the glyphs by using Font Book (Finder > Applications > Font Book). Select View and and change to Repertoire. You may then copy the desired glyph using "Command+C" and paste it into your document or drag and drop the glyph into your design application. Yes! We want you to make money using our fonts. An overview of our License and Usage Policy can be found here. Why is my order being rejected by the shopping cart? The most common cause of failed payment attempts is credit card information not matching what your card issuer has on file. It may be that you are indeed using the correct address, but perhaps because of a recent move or other change, the information no longer matches correctly. Letterhead Fonts uses a strict Address Verification System and all information must match. Some credit card issuers outside of the United States do not participate in the AVS (Address Verification System) and therefore cannot be verified in that manner. If this is the case, it will be necessary for us to verify you manually. Please contact us if you suspect this is the case. Please ensure that you are typing the correct security code for the card being used. This code is 3 digits for Master Card and Visa and located on the reverse. American Express security codes are located on the front and consist of 4 digits. Some credit card issuers place restrictions on internet purchases. Therefore, these cards may not be used to order fonts until you call them and request that the restriction be lifted. If you are receiving the error code 9010, you may be attempting to order from a country that we do not accept payment from. You may also see this error if you have selected the wrong country in your billing information. If you are attempting to order from within the US and you are receiving this error, please contact us right away. For security purposes, any orders attempted using an anonymous proxy or VPN will fail. If your order fails repeatedly, your account will be blocked, in which case you will receive the message "Too Many Failed Payments". Please contact us for assistance with your order. Why am I receiving the "Already Registered" error? The credit card you are attempting to use is already registered to another Letterhead Fonts account. Each Letterhead Fonts account must have a unique credit card (or PayPal account) associated with it. Instead of creating a new account, please login using your existing account and update the required information. If you are creating a new account because your email address changed, simply contact us and we'll be happy to update the email address for you. Please do not create a new account. Doing so will cause your old account to become disabled and you will be unable to download your previous purchases. Not all fonts qualify for the custom package discount. Usually these are new fonts or premium fonts like LHF Desire. Can I use these fonts in my programs? All Letterhead Fonts are Postscript OpenType. This is the highest quality format available. This means that the letters you see on your screen are exactly the way the original artist drew them. Older formats, such as TrueType, are undesirable because they alter the original letters by adding several unnecessary points to the paths and change the lines. If you are in doubt as to whether your applications can use Postscript OpenType fonts, please download and install our .OTF test font prior to ordering. View this chart to check to see if your program supports Postscript OpenType. Can I try the fonts before I buy? Yes, we have a handy TypeTester which allows you to type your own message using the fonts. When you're ready to purchase, just click on the "Download" button at the bottom. How many computers can I install the fonts on? You may install the fonts on up to 2 computers (per license) purchased by you or your company. If you need to install the fonts on more than 2 computers, each font page has a drop-down menu which allows you to purchase multiple licenses at a discounted price. For instance, if you purchase 5 licenses for a font, then the font may be installed on 10 computers purchased by you or your company. How do I migrate my fonts to a new computer? Our fonts work for both PC and Mac. If you are switching from one to the other, dont worry, the process of downloading your fonts to a new system is the same for both PC and Mac. On your new system, please log in to your account. Once logged in, you will automatically be taken to the Account Manager page, where you can view and download all previous orders. You will see a green "Download" button next to each order description. Once you have downloaded your previous orders, view this link for help installing. Unless you have purchased additional licenses, you may install the fonts on up to 2 computers (per license) purchased by you or your company. Please make sure you have only installed the fonts on up to 2 computers at any given time, or contact us to purchase additional licenses. Can I give the font to my friend / designer / printer? If you are a client and wish to have a designer create a logo or other project for you using our fonts-- do not purchase a license. Since the fonts will be licensed to you, only you may use the fonts and your graphic designer will not be able to use the fonts. Instead, have your graphic designer purchase a license and then bill you for the cost. If a client desires to use the same font that you used for their work, they must purchase a license for themselves. Remember: Only the person or company that purchased the license, may use the font. Never under any circumstances send your fonts to any third-party. You have no control over what happens to these fonts once they leave your hands. And because your name and account ID is embedded into the fonts, you will be held responsible for damages incurred should the fonts become distributed. The following tutorial explains how to extract your font files from the downloaded packages and then install them easily in Windows 7 and newer. Double click on the .zip package you downloaded. This will create a folder on your Desktop containing the fonts. Double-click on the fonts to open Fontbook. Click on the "Install" button to install the fonts. Open your desired program. Your Letterhead Fonts will begin with the preface "LHF." Why aren't the fonts showing up in my application? Most applications must be closed when you install the fonts. If the fonts are not appearing in the list, restart the program for the changes to take effect. In some cases the operating system is to blame. Therefore, restarting the computer may also be necessary. All Letterhead fonts begin with the preface "LHF". This means that the Unlovable font is actually named "LHF Unlovable" and therefore would appear within the L's in alphabetical order. Please make sure that you have followed the instructions for installing the fonts and that you have properly extracted the fonts from the .zip package they came in. Attempting to place the .zip package itself into the System Font folder will not install the fonts. They must be extracted first. A good test is to see if the fonts are available in WordPad (PC) or SimpleText (Mac). If the fonts appear there, then the fonts are installed correctly and the problem is something else. If your application is very old, there is a chance that it cannot use Postscript OpenType fonts at all. Check the program compatibility chart. If you are in doubt as to whether your applications can use Postscript OpenType fonts, please download and install our .OTF test font prior to ordering. Why are the letters cut off or incomplete? Some of our font sets include decorative bottom or top halves, shadows and lines that are not supposed to be used by themselves. You are probably looking at a decorative font that is part of a multi-part set and the font you are viewing is intended to be placed on top of the base font in the set. For these to make sense, look for the solid base font in the set and try laying these decorative fonts on top of that base font and then change the color. The font's page will explain in more detail how to use these fonts and show examples. You can also refer to the instructions that came with the font in the package. When do I receive the fonts? Verified accounts may download fonts immediately with no waiting. If you have not placed an order with us before, your account must be manually verified before you may download the fonts. Therefore, you may need to wait up to 15 minutes for us to verify the order. Please ensure that you provide accurate information when creating your account. Erroneous information may result in delays. Once your account has been verified, you will receive an email instructing you to download the fonts. Your future purchases will not encounter any delay. Yes. Check out our popular 6 for $198 package where you choose any 6 fonts for only $33 each (even fonts that are regularly $63!) Additional fonts after 6 are also discounted, so the more you buy, the more you save. A few fonts don't qualify though-- usually new releases or premium fonts like LHF Desire. Where is my bonus font/panel? If you chose a bonus gift when checking out, you were presented with two .zip packages when downloading (one for the order and one for the bonus gift). If you forgot to download your bonus gift, you can do so by simply logging into your account. You will then find your bonus gift below your order in a section named "Bonus Gifts". If you forgot to choose a bonus gift when checking out, you may contact us and we can place into your account. Looking for a designer? Need a sign made? Please see our list of talented designers and sign artists who proudly use our fonts.